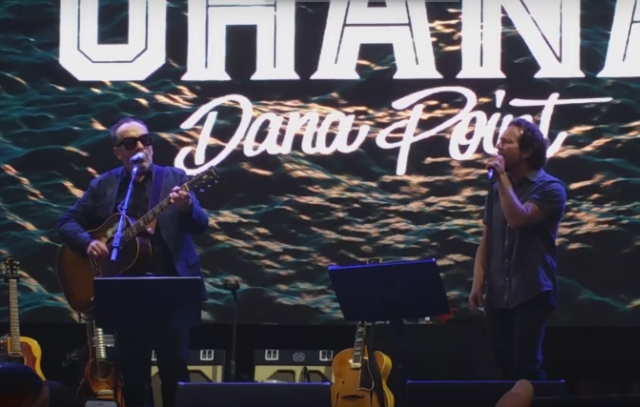 Eddie Vedder performed at the first ever Ohana Festival at Dana Point, California’s Doheny State Beach yesterday, and he really made the most of it. He joined Elvis Costello during his set to sing on “What’s So Funny,” X during their set to play “The New World,” and former Red Hot Chili Peppers and Pearl Jam drummer Jack Irons during his set to cover Pink Floyd’s “Shine On You Crazy Diamond,” and during his own set, he played “Indifference” with professional surfer Kelly Slater and covered Neil Young’s “Rockin’ In The Free World” with Band Of Horses, X, and Kelly Slater to close out the fest. He also played new song “Out Of Sand,” which debuted on a Third Man Vault Voice-O-Graph recording earlier his year, live for the first time. Yesterday marked the 25th anniversary of Pearl Jam’s Ten and the 20th anniversary of No Code. Watch fan-shot footage from the festival below.